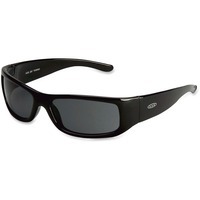 Surf inspired Moon Dawg safety glasses offer a comfortable, stylish choice for protective eyewear. Polycarbonate lens absorbs 99.9 percent ultraviolet light. Lightweight, wide temple frame offers enhanced side coverage. Durable construction makes it a cool outdoor safety sunwear option. High impact vision protection meets the High Impact Requirements of ANSI Z87.1 2003. Safety glasses are perfect for assembly, cleaning, electrical, facility maintenance, grinding, machine operations, painting and sanding.